In the wake of Loki Familia's aborted invasion of Knossos, they must pick up the pieces from the losses they accrued. Then there's the startling destruction of Ishtar Familia, who they had been investigating for ties to the Evils. Bete offends many in the familia with his harsh words about fallen comrades, to the point that he is exiled until he can cool his head. He soon reluctantly finds himself in the company of Lena, a young Amazon who he barely remembers besting during the fight in Meren and has now passionately fallen for him because of that. Nothing Bete says or does seems to discourage the girl, which becomes a potentially deadly problem when Thanatos Familia's Vanetta decides to eliminate all former members of Ishtar Familia on the off chance that one of them might know where the key to Knossos is. Meanwhile, the rest of Loki Familia is also in search of that same key. Since the earliest chapters of the franchise , the lanky werewolf Bete has served as the franchise 's resident troublemaker. He is gruff, unfriendly, and commonly behaves badly, especially towards anyone he perceives as weak. Though he definitely understands the value of teamwork, he generally does not work well with others beyond maybe Aiz, whose strength he respects and towards whom he has been implied to have at least a bit of a crush. 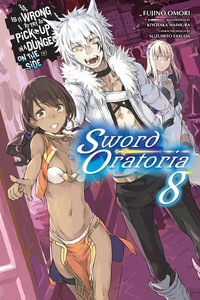 Previous installments of Sword Oratoria have shown that he does have a very rough sort of “tough love” approach and, for all of his verbal abuse, will actually avoid actually inflicting violence on those he perceives as helpless, but for the most part his merits have been limited to his strength and tenaciousness as a warrior. This volume, for the first time, delves into what makes him tick, and that can make it a compelling read for fans of the franchise . The story is set a few days after the events of volume 7 of the main series and deals with fall-out both of that novel and the events of volume 7 of this series. In the former case, it elaborates some on how the Amazons who formerly served under Ishtar have been scattered into new familias, with Aisha once again having a prominent role. (Between this and the main series, she is becoming one of the franchise 's most frequently-recurring characters outside of the focal point familias.) The latter case reveals the death of a significant supporting cast member from Loki Familia's roster and how both Loki Familia and the villainous Vanetta are responding strategically to the events of both novels. The healer Amid also continues to play a significant supporting role as she develops a means for countering the effects of the cursed weapons used by Thanatos Familia and the assassins they hire. The hunt for the unaccounted-for key to Knossos is really just a framing device for exploring Bete's backstory and character, however. Assorted flashbacks and ruminations reveal that Bete did not end up the way he is just because he is naturally mean; he was shaped that way by his experiences, especially back in the tribe that he originally hailed from, where weakness was not much tolerated. The story reveals that Bete, much like Tiona and Tione, was raised to be a warrior and hunter from an early age and was originally part of a different Familia upon arriving in Orario. Also like with Tiona and Tione, his recruitment into Loki Familia involved getting the crap kicked out of him by its more powerful senior members. The writing also takes pains to show how past tragedies involving women in his life have shaped his attitude and uncompromising disposition, giving the sense that at least part of Bete's obsession with strength and abhorrence of weakness comes from protecting himself against further losses. His problem in this case is that he's encountered the one kind of girl he (literally and figuratively) cannot successfully push away; that Lena seems at least somewhat masochistic only further complicates matters for Bete and creates some uneasily amusing moments when he reacts with horror to the realization that violence towards her is only reinforcing her attraction. While the story gets good mileage out of the developing love interest for Bete and the way he can now sympathize with Finn having to deal with Tione, perhaps just as significant is a further elaboration on how his abilities work. We know from volume 6 that he becomes immensely stronger in moonlight as a racial trait, but there has never been even a vague suggestion about what his personal magic is outside of end-of-novel profile pages. Climactic fights in the latter part of this novel finally reveal both that and why he has not been seen using it before, as well as also revealing Vanetta's own nasty brand of personal magic. These are all part of a series of battles which highlight author Fujino Ōmori 's sometimes-frustrating habit of overwriting battle scenes (and especially the injuries that heroes endure through) to the point of absurdity. Beyond that, the technical aspects of Omori's writing are the same as ever; his annoying stylistic quirks are still annoying. The one thing that is continuing to gradually improve is providing a better sense of recent history for his characters and setting, a development which can also be seen in the main series, though he also does a reasonably good job of delving into the core of Bete's psyche. He also does find brief moments of humor this time in the way certain characters react to finding out about Lena and takes time to examine how other characters perceive him as well, something Omori didn't do as much with the Amazon twins. On the technical front, the book clocks in at 219 pages, including the standard trifold glossy color art in the front and black-and-whites throughout; the quality of the artwork in general seems a little higher this time around, however. Curiously, the profile provided this time is for Finn. The standard Afterword reveals that Bete was both not a character whose background had originally been envisioned and not originally a much-liked character by stakeholders. That Omori persisted with the character was the right call in the long run, as Loki Familia wouldn't feel complete with the werewolf that (in Omori's own words) is starting to look more and more like a tsundere. Ultimately, even if Bete isn't one of your favorite characters in the franchise , this can still be a satisfying read for the storylines it continues and the new dimensions that it offers.